Progressive home builders are continually looking for points of differentiation in order to attract new customers. The next generation of Home buyers will increasingly expect Home builders to include some level of Smart Home Technology. Traditionally, introducing Smart Home technology into new homes has been an expensive affair with complex installation involved. Furthermore, the effort to continually evaluate, select and implement new Smart Home Technology that meets the prospective owner’s expectation of both function and value is not to be underestimated. Most builders realise this and may not be in a position to provide continuing support to Smart Home Owners. As a consequence, most builders avoid introducing Smart Home Technology into their new home offering. At goSmart Lighting, we remove these barriers for you. goSmart Lighting is the Exclusive Victorian Distributor of innovative Smart Lighting products. These products have been carefully selected and evaluated to ensure the highest level of value and reliability possible. The Smart Home Builder Program – goSmart Lighting issues a limited number of supply agreements with Home Builders in Melbourne. The new Smart Home features differentiates the Builders from their competition, the program enables the Builders to implement the latest Smart Home Technology without added installation complexity and the on-going burden of customer support. The Smart Home Builder Program commences with goSmart Lighting providing Smart Home Lighting Devices to automate an average size display home at no cost. 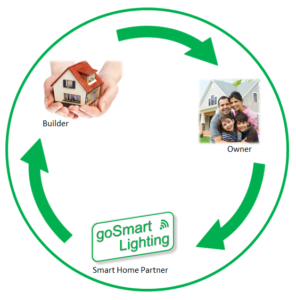 Builders will purchase Smart Home Products exclusively from goSmart Lighting during the 12 month program period. Builders may elect to enter into a further 12 month period subject to availability. No additional funding is necessary to maintain program membership. Installation of the Smart Lighting Devices is undertaken by the builders existing electrical contractor and does not require additional effort or knowledge compared to traditional lighting installations. goSmart Lighting will provide the Builder a number of support services including electrical lighting plans and on-site Sales Staff training sessions. goSmart Lighting provides customer guides to the new home owner after final settlement. All on-going home owner support including 3 Year replacement warranty service is provided by goSmart Lighting.